As much as I love The Devil Wears Prada movie I never attempted to read the book. I guess part of the reason I didn't read it was because I didn't want it to ruin the movie. The Devil Wears Prada is so iconic and nothing can really compare; it's similar to me not reading 'The Notebook' after the movie became such a classic. Nothing can live up the OG... and in these cases, the movie is the OG. Well, when I saw that Lauren Weisberger was coming out with another DWP book, I got super excited. I don't think I realized that she already had a sequel called "Revenge Wears Prada" but I didn't even bother with that book. I was super hyped for this third installment that followed our favorite frenemy, Emily, around. The book is titled "When Life Gives You Lulu Lemons" and something about that title just drew me in. It recently came out just a week or so ago but I read it months back because I got an advanced copy on NetGalley. Let me just say, it was an incredible book and I read it pretty quickly. It's 'chick-lit' so nothing too serious or a book you need to be truly invested in but it was still excellent. The great thing about the book was that you didn't have to read either of the first books to understand it or be invested in it. It was really well written, well developed and had an interesting story that made me angry, in the best way possible. Just as the summary and title states, the novel is filled with name drops of brands and has that same Devil Wears Prada vibe of wealth and fanciness. It's one of my favorite parts if I'm being honest. Another great part about When Life Gives You Lulu Lemons? Miranda Priestley and Andy Sachs make an appearance or two and it just ties the stories together perfectly. This isn't the first Lauren Weisberger novel I read. Two years ago I read "The Singles Game" and both books definitely have a similar style/storyline while still having that luxurious feel to it. 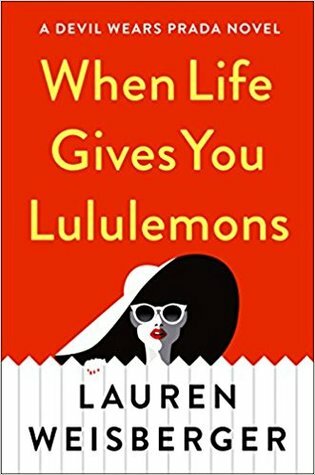 'When Life Gives You Lulu Lemons' is the kind of book I love when I'm not reading something thrilling. It's light-hearted but still has an interesting storyline that keeps you invested. It's not too cheesy or romantic -- it's a perfect read. All in all, I think When Life Gives You Lulu Lemons was fun, annoying (because you were rooting for something to happen/figure something out), interesting and light. It was definitely one of my favorite books of the year so far so I highly recommend it! Will you pick up When Life Gives You Lulu Lemons?